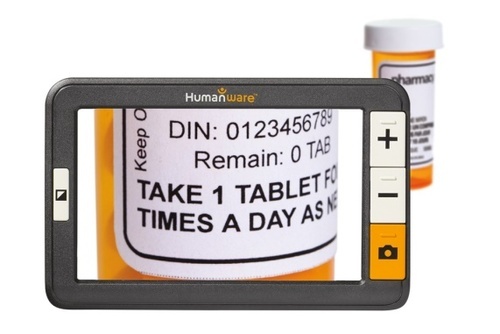 A portable electronic magnifier that has a HD LCD screen with a HD auto focusing camera. The camera features close-up and distance modes. It features a 5 inch anti-glare screen, large simple buttons, 2.2X-22X magnification, 18 enhancement modes, freeze frame mode, a pop-up stand for reading on a table, TV output to display what you are magnifying on the bigger screen and up to 3.5 hours battery life.